This article is about the manga. For the film based on the manga, see Tomie (film). For the film series, see Tomie (film series). For the character, see Tomie Kawakami. Tomie (富江) is a Japanese horror manga series written and illustrated by Junji Ito. Tomie was Ito's first published work he originally submitted to Monthly Halloween, a shōjo magazine in 1987, which led to him winning the Kazuo Umezu award. The manga has been adapted into a live action film series with eight installments to date, and an anthology TV series released in 1999. The manga centers on the titular character: a mysterious, beautiful woman named Tomie, identified by her sleek black hair and a beauty mark below her left eye. Tomie acts like a succubus, possessing an undisclosed power to make any man fall in love with her. Through her mere presence, or through psychological and emotional manipulation, she drives these men into jealous rages that often lead to brutal acts of violence. Men kill each other over her, and women are driven to insanity as well — though there are some who are strong enough to resist her. Tomie is inevitably killed time and again, only to regenerate and spread her curse to other victims, making her effectively immortal. Her origins are never explained, though it is suggested by some older men in the series that she has existed long before the events of the manga. Each story showcases various characters that encounter Tomie in her many (often hideous) forms, with some having their own arcs or returning in later chapters. Tomie's regenerative abilities (partly fuelled by cannibalism) are also showcased: aside from recovering quickly from gruesome and seemingly mortal wounds, she can also replicate herself by sprouting unnaturally from any part of her body, whether it be from severed limbs, organs, or even her spilt blood. Radiation accelerates her healing/regeneration process. Her cells are also capable of transforming a victim into a Tomie via an organ transplant. Multiple characters are even driven to dismember her corpse, unwittingly allowing more Tomie copies to grow and spread throughout the world. Even locks of her hair are dangerous; burrowing into its victim's brain to possess them, and eventually kill them when it grows wildly within the body. It is also shown that even if Tomie's body is not injured, her body will attempt to sprout another Tomie through tumorous growths, usually when she is emotionally stressed. Some Tomie copies, however, can not stand one another; one is seen killing one personally, while others order it done through the boys they seduce/enslave. Fire is the only known method to destroy a Tomie for good, though only if the flesh is completely carbonized. The final story arc reveals that a baby girl can grow naturally into a Tomie via a blood injection, and that she can age if she has not yet copied herself. The man responsible for these injections is a horribly burnt stranger — once a supermodel disgraced by a Tomie in his past — who seeks revenge by making one of these "natural" Tomies old and ugly. He manages to encase a Tomie named "Ayaka" in a block of cement with the help of Ayaka's older sister. The two then wait for many years — endlessly hearing her tormented cries — before finally breaking the block, revealing that Tomie had somehow escaped through a tiny crack. 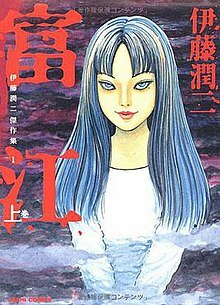 Tomie is published by Asahi Sonorama and appeared as a serial in the manga magazine Monthly Halloween from 1987 to 2000. Tomie received one bound volume on February 1996, titled Tomie no kyōfu gaka (富江の恐怖 画家, lit. Tomie of Fear: Painter). Two volumes were collected into the overarching series The Junji Ito Horror Comic Collection (伊藤潤二恐怖マンガCollection) as volume 1 and 2 of the series. Asahi Sonorama released an omnibus volume in February 2000 titled, Tomie Zen (富江 (全)). ComicsOne released both volumes in April 1, 2001, with flipped artwork (read left-to-right). A second series titled Atarashī Tomie (新しい富江, New Tomie) was serialized in Nemuki and was collected into a single bound volume titled Tomie Again: Tomie Part 3 (富江Again―富江 Part3) and released on March 2001. Tomie was re-released again as part of The Junji Ito Museum of Horror (伊藤潤二恐怖博物館) series. This version was also released in two volumes with the addition of the chapters originally released in Tomie Again. Dark Horse Comics released this version in its original right-to-left format. Asahi Sonorama re-released the manga again in two volumes as part of the Junji Ito Masterpiece Collection (伊藤潤二傑作集, Itō Junji Kessaku-shū) on January 20, 2011. Viz Media announced their license to the series on March 26, 2016. They published it as a single hardcover volume, similar to their releases of Gyo and Uzumaki. Tomie has been adapted into a series of Japanese horror films released between 1999 and 2011. There are to date eight films in the series. The films manage to recreate the atmosphere of the manga. Most of the manga stories occur during the dark of night for its sense of eeriness, and the films generally follow suit. Tomie's sexuality in the films is more ambiguous. In the manga, Tomie's attitude towards other women seems to range between thinly-veiled hostility and outright murderous rage (unless she stands to profit from them), while the film incarnation is known to seduce women as well as men. Junji Ito won the 1989 Kazuo Umezu Prize for his work on Tomie. Since then, the manga has spawned a cult following and is still generally praised by fans and critics alike. ^ "The Official Website for Tomie: Complete Deluxe Edition". Viz Media. Retrieved December 2, 2018. ^ "The Junji Ito Interview". Retrieved 20 April 2013. ^ 画家 (ハロウィン少女コミック館 シリーズ富江の恐怖) [コミック] (in Japanese). Amazon.co.jp. Retrieved 2014-05-31. ^ "伊藤潤二恐怖マンガCollection (1) [コミック]" (in Japanese). Amazon.co.jp. Retrieved 2014-05-01. ^ "伊藤潤二恐怖マンガCollection (2) [コミック]" (in Japanese). Amazon.co.jp. Retrieved 2014-05-01. ^ "富江―The complete comics of Tomie [コミック]" (in Japanese). Amazon.co.jp. Retrieved 2014-05-07. ^ "Tomie, Volume 1". Amazon.com. Retrieved 2014-05-01. ^ "Tomie, Volume 2". Amazon.com. Retrieved 2014-05-01. ^ "富江Again―富江 Part3 (眠れぬ夜の奇妙な話コミックス) [コミック]" (in Japanese). Amazon.co.jp. Retrieved 2014-05-01. ^ 伊藤潤二恐怖博物館 (1) (ソノラマコミック文庫) [文庫] (in Japanese). Amazon.co.jp. Retrieved 2014-05-02. ^ 伊藤潤二恐怖博物館 (2) (ソノラマコミック文庫) [文庫] (in Japanese). Amazon.co.jp. Retrieved 2014-05-02. ^ "Museum of Terror Vol. 1 TPB". Dark Horse Comics. Retrieved 2014-05-02. ^ "Museum of Terror Vol. 2 TPB". Dark Horse Comics. Retrieved 2014-05-02. ^ 富江　上 (in Japanese). Asahi Sonorama. Retrieved 2014-05-14. ^ 富江　下 (in Japanese). Asahi Sonorama. Retrieved 2014-05-14. ^ "Viz Media Licenses Junji Ito's Tomie Manga". Anime News Network. March 26, 2016. Retrieved March 26, 2016.